I had to add the Ramos variant to my Wishlist. I really really adore this comic! 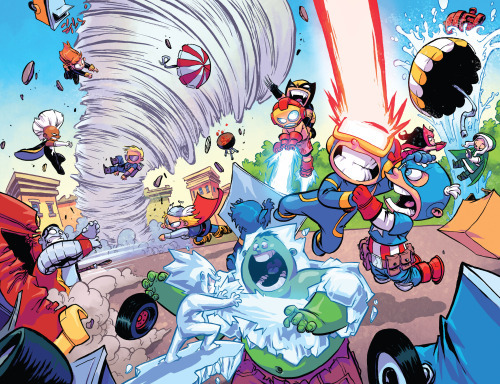 That Skottie Young knows how to make a great comic! The issue opens with a wonderful theme song, that I hope someone is making. The first real segment of the issue is the terrific Magik v Iron Man four page sequence. Iron Man tries, mistakenly so, blow Magik off. He destroyed a beloved action figure of his. She calls him on his nonsense. Cap takes her side, as he should! 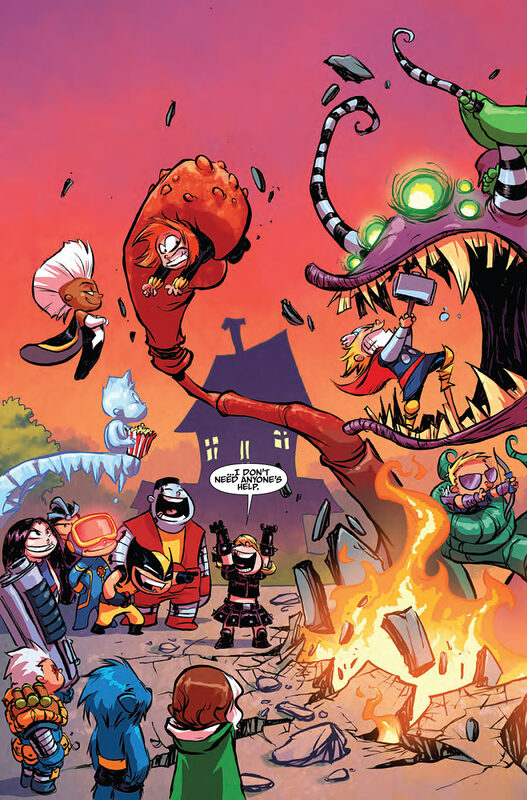 Skottie Young really gets that Magik is unstoppable, and really only allows the X-Men to take advantage of her assets. She has summoned a demon from Limbo and is taking care of the Avengers. The only Avengers missing from this page, that are also in Avengers : Age of Ultron, are Vision and Quicksilver. At first, I thought only Quicksilver was missing but that makes sense that these Avengers would be the ideal team for Young to use. Whereas, he seems to have full range of X-Men to use, which I am all for. 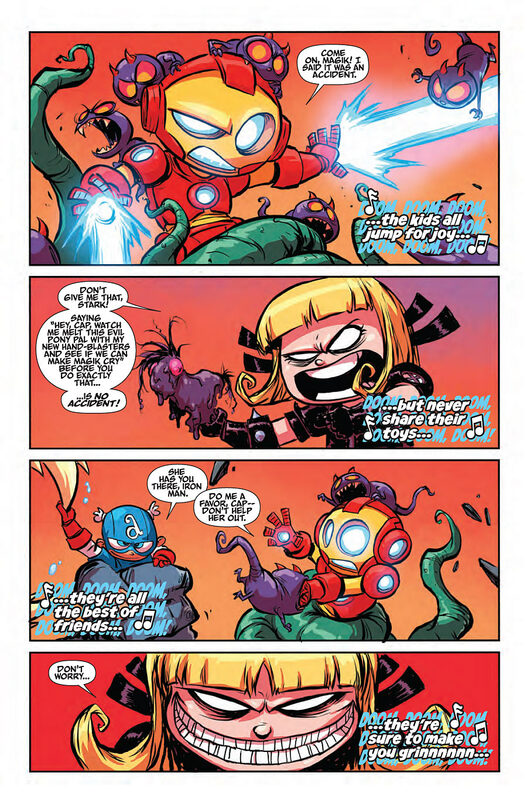 Iron Man keeps losing points with her, calling her beloved toy pony, a doll. She corrects him, it is an action figure. I do like how their fight ends, only because it is dinner time. It is Tuesday, so it is pizza night and the pizza is coming from Da Vinci’s. They have good sausage there. Magik thanks Bob, the demon, for the assist. 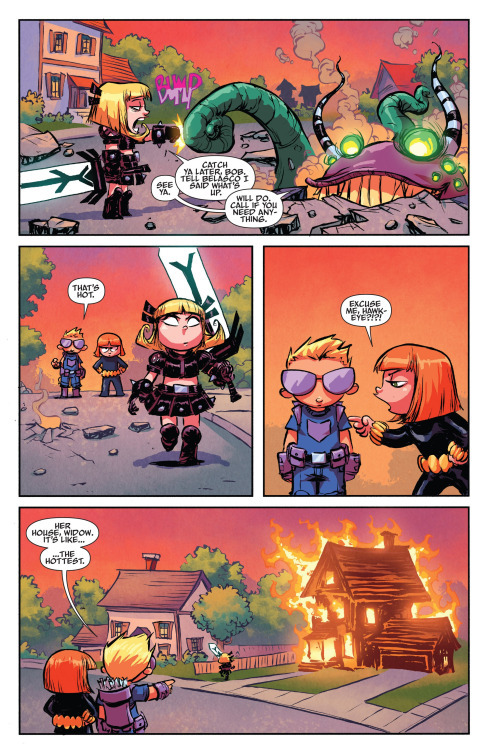 Hawkeye comments on how Magik’s house is on fire. The rest of the issue is a case for escalation. 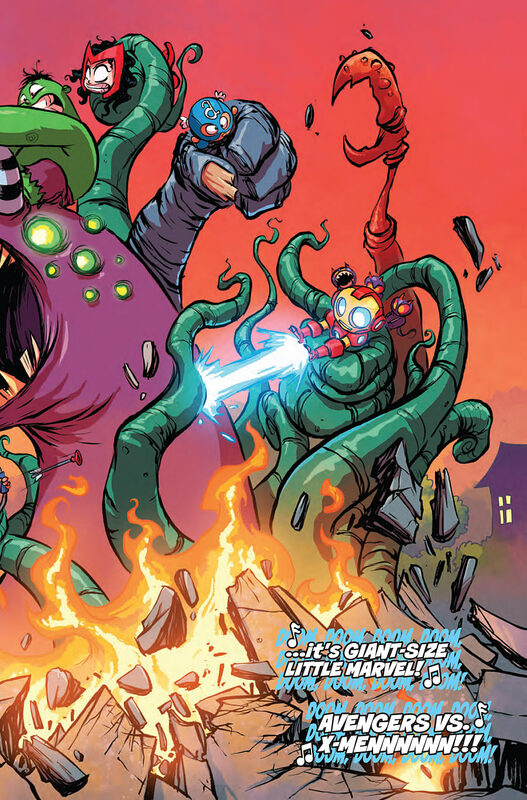 Blob and Toad are trying to get some lunch and the X-Men and Avengers keep trying to offer better food. Cyclops has Storm rain out Iron Man’s food truck. 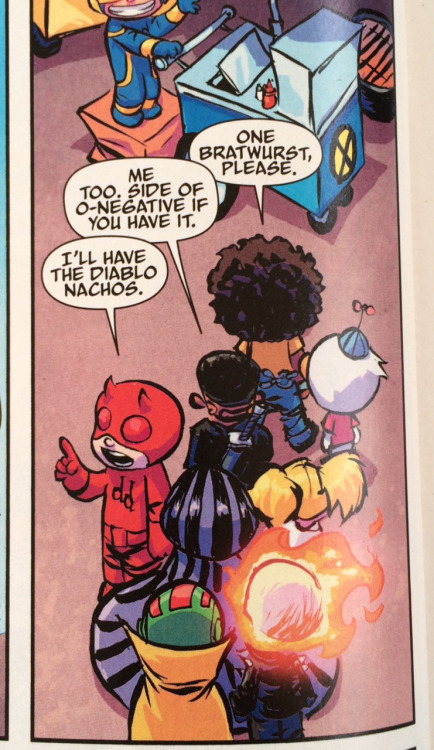 Cyclops really likes his eye related puns, no one else in the comic likes them but I’m all for them. All of this one-upmanship escalates to a big fight. We get some fun match ups. Cyclops v Captain America, of course. Wanda is fighting Rogue, who is unimpressed. Iceman v Hulk. Colossus v Thor, which is pretty one sided. Storm v Hawkeye & Black Widow, also one sided. Iron Man v Wolverine. We also get Archangel v Falcon. Captain Marvel and Namor are concern about Cable and Bishop, both from the future, using giant guns. The issue ends with everyone going home, but before they do, they meet a pair of twins, who I don’t recognize. They will most likely the series villains. 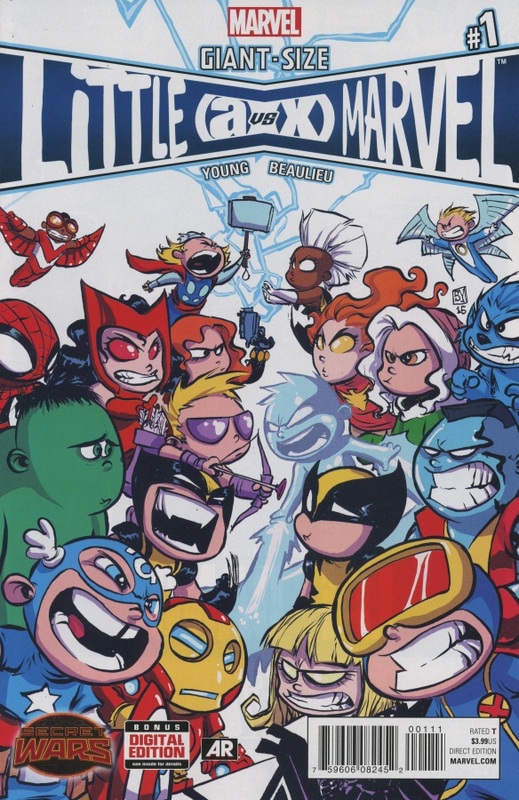 Odd that both Cyclops and Cap think twins are cool. What are they basing that off of? Wanda and Pietro? Northstar and Aurora? The Stryker twins? They really are not. Here is hoping Magik keeps appearing in this series!